Happy April. I organize my life by a school calendar, so my "year" is almost over. And I'm so happy. But that's not the point of today's post! I teach yoga at a studio 5 minutes from our house and I just love it. What I love more is some of the opportunities that come up because of working there. 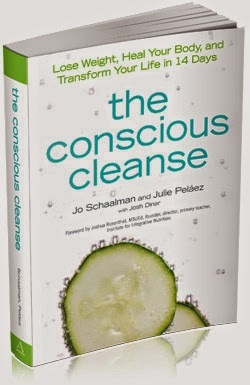 This month is cleanse month, where we are following the plan of The Conscious Cleanse. And somehow I convinced my husband to do this with me. and probably some other things that I can't think of at the moment. So basically we start the day with a green smoothie. Some have been good but today, for example, was a total bust. Note to self that arugula and flax seed do not make a good match. Then we have some almonds or an apple for a snack. Lunch is a salad. Cabbage, lettuce, celery, carrots, avocado, sprouts, and then our homemade balsamic vinaigrette. Then maybe some more almonds or fruit or brown rice, or if you are really desperate you can spoon almond butter from the jar and shove it in your mouth. For dinner we've had chicken and salmon with either a salad or some sort of vegetables. Then we can have hot water with lemon (yum). Honestly, the food part has not been that bad (we are on day 4), and I thought my biggest challenge would be the lack of wine in my house. But it is the caffeine. The sweet nectar of coffee. I miss the smell. I miss the taste. I miss the way it makes me feel in the morning. Caffeine withdrawal is serious business. We are crabby, we have headaches, and at one point I dreamed of bathing in coffee. Gross. But we are both feeling a little better today and I hope we are on the mend. I'm so glad we are doing this together, because I would probably make Ryan move out if he continued to drink coffee every morning when I couldn't. Also it is nice to have someone in my house to complain with. I'll keep you updated throughout the next week and a half. I will say I don't feel hungry and although it is not necessarily convenient, it is interesting to know absolutely every ingredient that goes into our meals. I need to hear all about this immediately.